The expert team of our company offers Testing Machine to our clients. These machines are widely brought into application in the engineering and automobile industries. The machines are durable and offer outstanding performance along with sturdiness. Our product range includes Gear Tester. 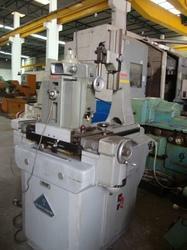 Being a quality based firm, we are offering a quality assured assortment of Gear Tester Klingelnberg PFS-600. The Gear Tester Klingelnberg PFS-600 we offer is widely demanded amongst the clients for its availability in committed time bound. Looking for Testing,Measuring & Tool Presetting ?